In a time when some industries are having challenges recruiting workers, Kennedy High School is taking steps to help its students gain practical skills and get an introduction to a variety of career areas. One of the first visible fruits of the school’s efforts is a garden shed, constructed by students in the first year Occupational Survey class. The shed will be displayed and, the class hopes, sold at the Wurstfest on Feb. 9-10 at the Mount Angel Festhalle. The proceeds from the sale will be used to purchase materials for another structure to be sold, making the process self-sustaining. Former Oktoberfest president and community volunteer John Gooley got involved with JFK’s Career Technical Education (CTE) program early on, and is excited about what the school and the students are doing. “To me, it’s a dream come true,” Gooley said, while standing in the school’s shop on a recent school day. The large warehouse-like room was built as a shop class in the 1970s, then later converted to a weight room when Kennedy discontinued shop classes about 10 years ago. While the high school has been moving forward with several CTE initiatives, like the Science/Technology/Engineering/Mathematics (STEM) Program, a $283,000 grant from the Oregon Department of Education jump-started the effort to bring back Agriculture classes, Future Farmers of America (FFA), and beginning shop classes. The grant also provided funds to make the school’s Ag teacher position full-time. and to hire a CTE Program Community Coordinator. Korrie Shull, who teaches Intro to Agriculture, along with the Occupational Survey and Animal Husbandry classes, is use to covering a lot of different subject areas, and that seems like a necessity for the job. Gooley and others stepped up to provide tools, equipment and materials that Shull needed in the beginning. 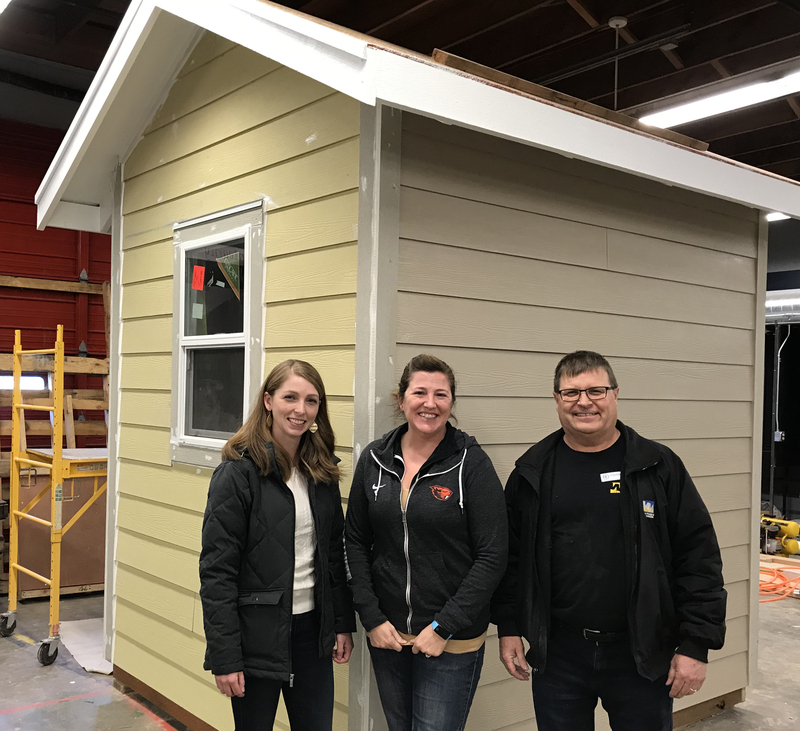 Shull was delighted to welcome another community volunteer, local home builder Tommy Riedman, who offered to help students build the garden shed. Riedman says he has also enjoyed the experience. “They seem really interested. I think they like the hands-on aspect of it where they can physically do something…. it seems like it is refreshing for them to have someone from the outside come in and talk to them about how to do things,” Riedman said. Everyone of the 14 students showed up on a Wednesday during finals week at 7:30 a.m., an hour before school, to paint the shed and put the finishing touches on it for display at the Wurstfest.